Today Nike Sportswear released their new fall Tech Pack and I couldn't be more excited. This is the line from Nike Sportswear that I nearly wait every year for since discovering Tech Fleece back in 2013. My ultimate favorite, the Nike Tech Fleece Poncho. I couldn't even explain what it was to my husband at the time, but all I knew was I had to have it. 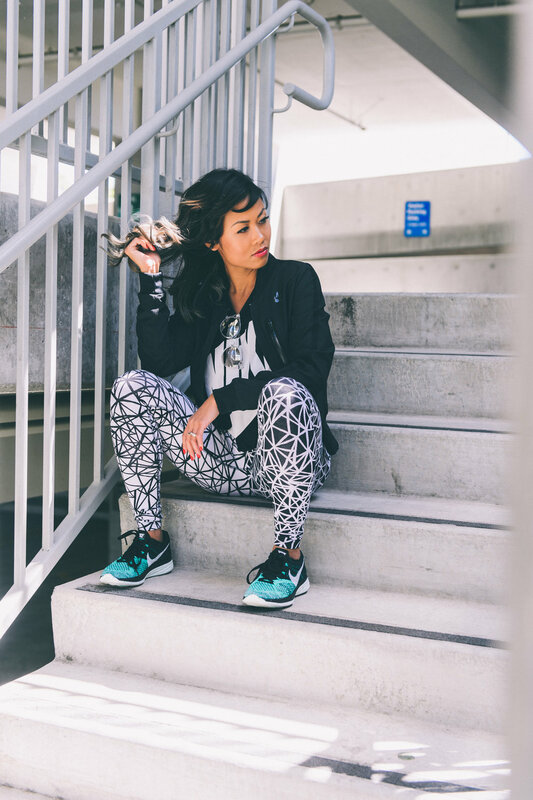 Here's how I styled the Nike Tech Fleece Crew with my Nike Tech Fleece joggers. It wasn't till about a year and a half ago I truly accepted seeing myself in photos. My first photoshoot with my husband was to photograph me for my blog which started to have more photos of me in April 2015. When you're overcoming body image issues it's easy to fall into a trap of picking yourself apart piece by piece. Especially when you start to notice things you don't like or progress you're not quite satisfied with when you've been working so hard to change your mindset and your physical appearance, either by losing weight or gaining muscle mass. We've all been there to certain degrees, we fat talk ourselves, point out our double chins, excess mid section rolls, or even the small things we can't change like birthmarks or scars. Sometimes these thoughts creep out of our mouths and other times we say them to ourselves in our minds. I was trying to describe how toxic this mindset can be and I compared it to secondhand smoke. For those who smoke cigarettes they only think about the negative affects it causes themselves rather than the affect it makes to those around you. This is the same with negative thinking. Though we keep those thoughts or comments to ourselves what we don't realize is the ripple affect it makes to those around us. These photo shoots with my husband have been such a self development process. Not only do we both get to collaborate in my creative outlet together and learn how to work with one another in this process, but we're also creating a space of healing. With each photo shoot I'm learning to peel back layers of self hate and truly finding and honoring the things that I love about myself. This hasn't been an easy process, on the surface it may seem like its just an opportunity for beautiful content. But for me its an opportunity to change the opinion I've had on myself for years and to learn to see what the rest of the world sees.